Simply stated, eBay Bucks are the online marketplaces' equivalent of a rewards program offered by banks, airlines, and retail stores. Think of it like Air Miles. For every dollar you spend on eBay, you earn a percentage back to buy the things you would already. This adds up and can be redeemed quarterly. The free shopper rewards program applies to qualifying items on eBay that are marked with an eBay Bucks icon. Upon receipt of your eBay Bucks certificate, (sent to the email address linked to your eBay account), you have 30 days to redeem the rewards to get free stuff. They work like an eBay-specific gift certificate. 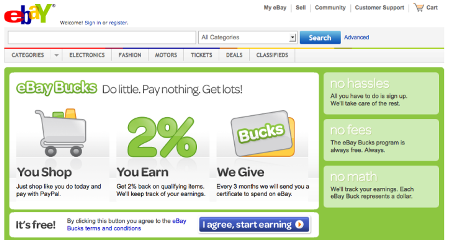 To get eBay Bucks, all you have to do is sign up by enrolling in the program. From there, you just shop on eBay like you normally would. You'll automatically get a percentage back on qualifying purchases. Be a US or Canadian resident and have a PayPal account. Be an eBay member in good standing with no holds or suspensions. Buy a qualifying item (marked with an eBay Bucks icon) and pay with PayPal. Earnings are calculated at 2% and you can earn up to $100 per transaction (regardless of the number of items purchased in that transaction). Participants can receive up to $500 in eBay Bucks per three-month earning period. Log in to eBay with the user ID you used to sign up for eBay Bucks. Start shopping on eBay and make sure the seller accepts PayPal. Pay for your item with PayPal before the expiration date on your eBay Bucks certificate. During checkout on eBay, your eBay Bucks certificate will appear. More information about how to use your eBay Bucks including trouble-shooting can be found here. Depending on what monthly additions you make to your collection through eBay, your eBay Bucks may result in cash rewards that are nominal, monumental or somewhere in between. That said, it is important to plan your purchases accordingly. Let's take a look at a specific example when it comes to purchasing new, unopened product. Say you are planning on buying a box of 2011 Score Football. You have decided to buy the item from Blowout Cards, your usual online retailer. Go to eBay, do an advanced search by seller, and see if they have the item listed on their eBay Store. It just so happens they do. Good. Now compare pricing. On eBay, Blowout has 2011 Score Football boxes listed for $34 and FREE shipping. On their main site its only $22.40, BUT NO FREE SHIPPING. Calculating the additional price for shipping and handling, you will notice that if you buy it from their eBay store, not only are you going to save a little, you are also going to earn $0.68 in eBay Bucks. Get it now? Using the eBay Bucks rewards program wisely can make it possible to add items to your collection you might otherwise not have been able to afford. However, with a built-in savings/annuity program like eBay Bucks, earning cash back on items you would buy anyway means a bonus check sent to you four times per year. Expanding on the above idea, how many times a month do you buy an item, typically, from a big box retailer that might have been available through eBay? If the seller offers free shipping and you can wait a few days for the item, this is another way to accelerate your eBay Bucks earnings. EBay Bucks really is that simple. So go start earning and get saving. I love the Ebay bucks. Earns me a few cards every quarter. Sometimes it’s only $2 dollar cards, but always fun getting something for free. Especially fun after the holidays as I do alot of shopping on Ebay.